Bespoke cycle coaching provided by a British Cycling Level 3 Road and Time Trial & British Cycling Level 2 Track certified coach. Offering personalised coaching designed for individuals to realise their specific goals through customised training plans. 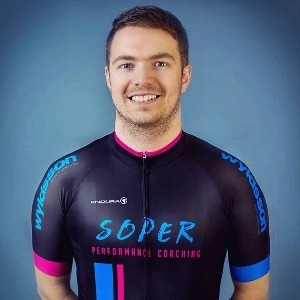 I have coached since 2010, working with both local and national level riders in Scotland as well as alongside Scottish Cycling volunteer coaching with the national youth set-up and the Under 16 riders at training as well as national level events since 2013. My philosophy in coaching is based around ensuring the athletes I work with set and achieve ambitious goals and targets throughout their training and racing seasons. To work with an athlete in developing their ambitions and seeing them achieve what they have targeted through their hard work and dedication is the driving force behind the creation of Soper Performance Coaching at the start of 2016. I strongly believe in continuous development of my self in coaching to improve the services and support I can provide to the athletes I work with. Minimum requirement for athlete to have ability to provide heart rate data. Success. Coach Chris Soper has been notified of your message. To hire Chris Soper as your coach, select the coaching service that is right for you.